SP1 Which of the following best describes how spam affects your life on the Internet? 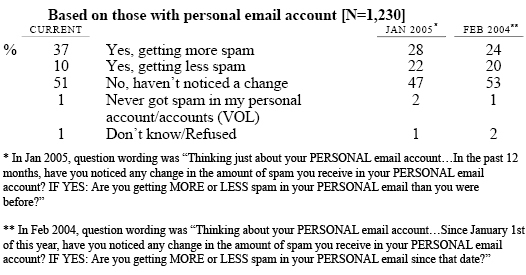 SP2 We’d like to know if unsolicited email, or spam, has affected you in any of the following ways. Has spam…? SP5 Thinking just about your PERSONAL email account…In the past 12 months, have you noticed any change in the amount of spam you receive in the INBOX of your PERSONAL email account? 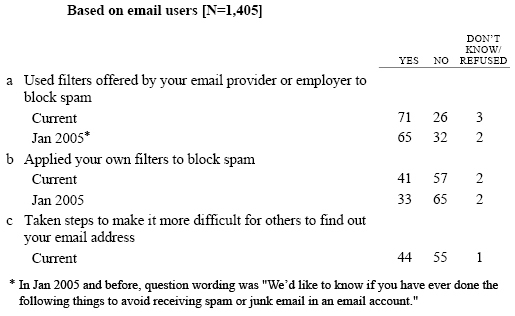 IF YES: Are you getting MORE or LESS spam in the INBOX of your PERSONAL email than you were before? 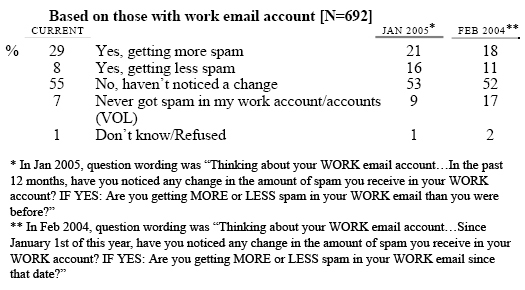 SP6 Thinking just about your WORK email account… In the past 12 months, have you noticed any change in the amount of spam you receive in the INBOX of your WORK account? 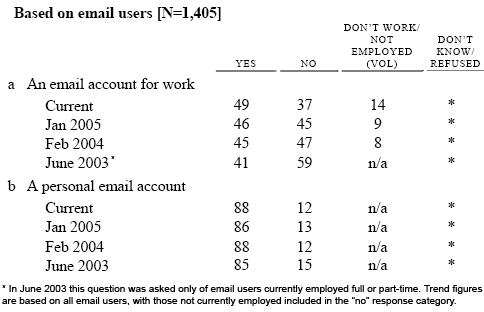 IF YES: Are you getting MORE or LESS spam in the INBOX of your WORK email than you were before? SP18 We’d like to know if you have ever done the following things to keep spam out of your inbox. Have you ever…? SP3 Thinking about all of the times you’ve received unsolicited email, have you ever…? This report is based on the findings of a daily tracking survey on Americans’ use of the Internet. The results in this report are based on data from telephone interviews conducted by Princeton Survey Research Associates between February 15 to March 7 2007, among a sample of 2,200 adults, 18 and older. For results based on the total sample, one can say with 95% confidence that the error attributable to sampling and other random effects is plus or minus 2.3 percentage points. For results based Internet users (n=1,492), the margin of sampling error is plus or minus 2.8 percentage points. In addition to sampling error, question wording and practical difficulties in conducting telephone surveys may introduce some error or bias into the findings of opinion polls. PSRAI calculates a response rate as the product of three individual rates: the contact rate, the cooperation rate, and the completion rate. Of the residential numbers in the sample, 76 percent were contacted by an interviewer and 41 percent agreed to participate in the survey. Eighty-seven percent were found eligible for the interview. Furthermore, 94 percent of eligible respondents completed the interview. Therefore, the final response rate is 29 percent.